San Francisco, California – Today Nokia introduced HERE, the first location cloud to deliver the world’s best maps and location experiences across multiple screens and operating systems. With the new brand, HERE, Nokia aims to inspire a new generation of location services and devices that make the mobile experience more personally significant for people everywhere… To further extend its location services, Nokia is launching a maps application for iOS under the HERE brand. …but horrific corporate management has it in a place where it may be forced into a patent firesale. Hardware is a key element, but, as we saw with Apple’s 2002 iPad, software, marketing, ecosystem and maybe most of all timing also play important roles when determining the success of a product line. When the time was right and the opportunities presented themselves, however, Nokia failed to execute. Anecdotally, I have a friend who worked with Nokia in advertising. He would say the same thing: The company was gridlocked by politics and poor leadership. Different product groups treated different parts of the company as competitors and not compatriots. 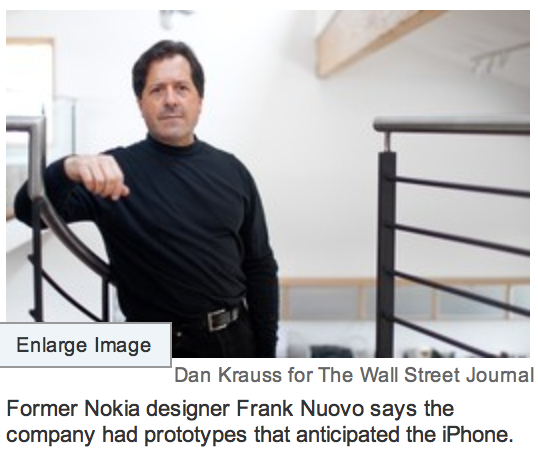 And, five years after the iPhone unveiled, Nokia is in a tail spin. This is causing a cash crunch so huge that it will likely be forced to sell off a lot of those early patents that are valued around $6 billion—which is just slightly under Nokia’s current $6.5 billion market cap. That means investors have very little confidence in the firms ability to succeed. In fact, had Google waited, Nokia might have been a better patent purchase target than Motorola. Nokia still is struggling to turn its good ideas into products. The first half of the year saw Nokia book more patents than in any six-month period since 2007, Mr. Elop said, leaving Nokia with more than 30,000 in all. Some might be sold to raise cash, he said. “We may decide there could be elements of it that could be sold off, turned into more immediate cash for us—which is something that is important when you’re going through a turnaround,” Mr. Elop said. It is pretty sad that a company like Nokia is not worth more than the patents it holds. Nokia and Microsoft seek smartphone alliance? Yet more fascinating action in the smartphone space with an unholy rumored combination between Nokia and Microsoft set to potentially change the structure of the market.